Rediscover your inner self; experience your passion for living in this stunning beauty in complete harmony with its environment. Calabash Cove is a romantic and quiet boutique resort, just waiting for you to experience. At Calabash Cove each of the charming accommodations are all beautiful, making use of natural materials wherever possible, and offer amazing views across the Caribbean Sea, of the capital Castries to the South, and nearby Martinique to the North, all from the privacy of your porch or balcony. The 1,000-square-foot Water’s Edge Cottages, handcrafted hideaways on the edge of Mosaic beach, feature private plunge pools, outdoor rain showers and hammocks, while the unique Swim-Up Jr. Suites offer private access to the resort’s stunning infinity-edge pool directly from your patio. Also available are the luxurious Sunset Oceanview Jr. Suites with oversized Jacuzzi tubs and spectacular views across the bay. 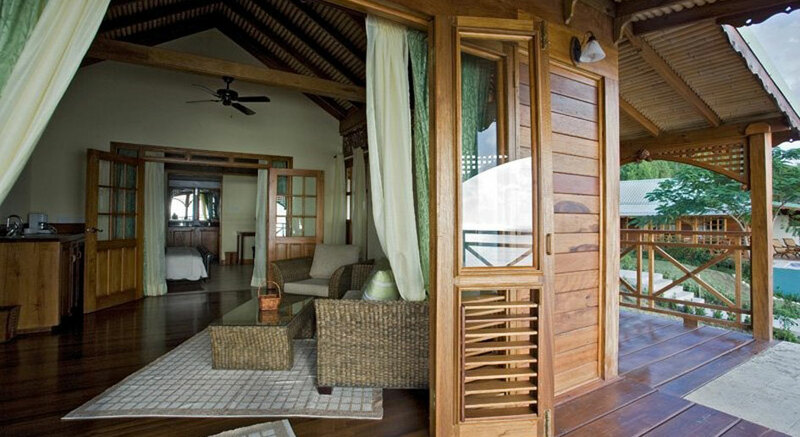 Balinese mahogany cottages with secluded plunge pools, jacuzzi tubs, outdoor rain showers and hammocks. Gaze and laze in a 1,000 sq. ft. hideaway on the waters edge, surrounded by its own tropical vegetation and an unparallelled vista across the bay with its daily free Caribbean sunset, while gentle breezes rest your mind, disturbed only by the flutter of the wings of your adopted hummingbird. Nearly 620 square feet of contemporary luxury and comfort, a step away from Sweetwaters, the infinity edge pool, offering unrestricted and private access directly from the patio of your room. Swim across to the bar and watch the sunset with one of their signature cocktails during happy hour, or take that romantic midnight swim you promised your loved one. The luxury ocean view suites facing the Caribbean Sunset offer between 620 and 660 square feet of living space and are located on the lower mezzanine of the Manor House above the Sweetwaters and the building adjacent to the Manor House overlooking the Mosaic Beach and the turquoise waters of the Caribbean Sea. Calabash Cove nestled is in a gentle hillside along the private Bonaire Bay offering old Caribbean charm with today’s amenities. The Windsong restaurant and C-bar overlook Sweetwaters. It is complemented with their open lobby offering stunning views of the coastline and blue waters of the Caribbean sea. Whispers is a music room to relax, read or enjoy a before or an after dinner cocktail. The main pool features a swim up bar and several decks for sun bathing, reading or a midday snack. Bonaire Bay only steps from the Watersedge cottages is framed by coconut trees, Bougainvillea, Heliconias and many other exotic flowers found locally. The Leisure Concierge at Calabash Cove offers a number of individually tailored excursions, specifically designed to enable you to experience the best that St. Lucia has to offer. Sail the high seas with one of St. Lucia’s charismatic storytellers, or treat yourselves to a romantic champagne picnic in the heart of the untouched countryside. Take an amazing hike to the top of one of our majestic Pitons and witness unrivaled views across the island and north to Martinique, or indulge in the same breathtaking views from the comfort of a helicopter. The options featured here represent only a small selection of what is available – whether you seek romance or adventure, or a combination of both, the Leisure Concierge will work with you to transform your dreams into reality. For a cozy couple’s massage, the resort’s Ti Spa is adjacent to the 40-foot Sweetwater infinity edge pool. Relaxing and revitalizing treatments combine European technique with St. Lucia’s rich tradition of plant and fruit-based treatments. Each can be enjoyed in a private treatment room or in the privacy of your room. The spa’s Fitness Centre is outfitted with Cybex cardiovascular equipment, and the beauty salon offers hair treatments plus mani-pedi services. Weddings at Calabash Cove are a memorable occasion, designed to maximize the unique experience of your special day. Calabash Cove offer’s a number of additional services for you to choose from to create the wedding of your dreams. As our valued clients, you will receive airport assistance and private transfers when you book your flights and accommodations with us. Please inquire with Remarkable Honeymoons for the latest rates and specials for Calabash Cove on St. Lucia.